The Nat Geo Kids team love this book! In particular, we are huge fans of Freja – she is one cool, adventurous and independent character. We also got hooked on the mysteries. They are truly addictive. 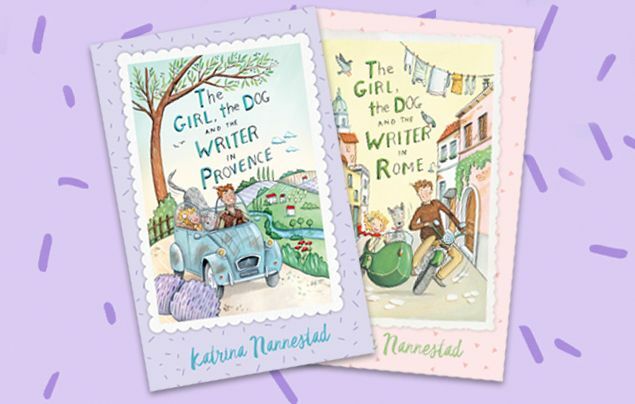 The Girl, the Writer and the Dog in Provence by Katrina Nannestad is OUT NOW! Fast fun facts about Provence! Although most inhabitants speak French, Provencal is the traditional language of this Mediterranean region. It is similar to Catalan or Spanish. Many street names and signs are in both French and Provencal. The three-week annual Festival d’Avignon in Avignon, Provence is one of the world’s great performing-arts festivals. Over 40 international works of dance and drama play to 100,000-plus spectators at venues around town. Michel de Notredame, better known simply as Nostradamus, was born in St Remy-de-Provence in 1503. A physician, a poet, a royal astrologer, Nostradamus is best known as a predictor of the future! The famous painter, Paul Cézanne was born 19 January 1839 in Aix-en-Provence and died 22 October 1906 in Aix-en-Provence. This is the second book in a series about family, friendship and finding yourself. Don’t miss The Girl, the Dog and the Writer in Rome, also by the award-winning Australian author Katrina Nannestad. We have THREE copies of The Girl, the Dog and the Writer in Provence up for grabs. Enter the competition HERE! For more about this top new read, and for more fab children’s books, flick over to harpercollins.com.au!